In Regina for a one-night stand to promote their upcoming album, Kick Axe came home and brought down the house Friday at the Centre of the Arts. Band members are (left to right) Larry Gillstrom, Victor Langen, Ray Harvey, George Criston and Brian Gillstrom. Friends, family and fans alike were on hand at the Saskatchewan Centre of the Arts Friday to welcome home Kick Axe for a night of raunch and roll. After a hectic summer touring North America with such heavy metal notables as Judas Priest, The Scorpions, and Quiet Riot, Kick Axe returned to where it all began for this five piece band now based in Vancouver. Brian Gillstrom, drummer for the band, summarizes the band sentiments: "It's really excellent coming back to our stomping grounds, our home, and we really appreciate the support. We want to thank everybody and we're going to put Regina on the map. Coming home helps keep you sane." Since leaving Regina for Vancouver five years ago, the band has secured a place for itself in both the Canadian and American markets. To date an estimated 130.000 copies of Vices have been sold. With strong backing received from CBS Records, plans are under way for releases in Australia, England, France and Japan. 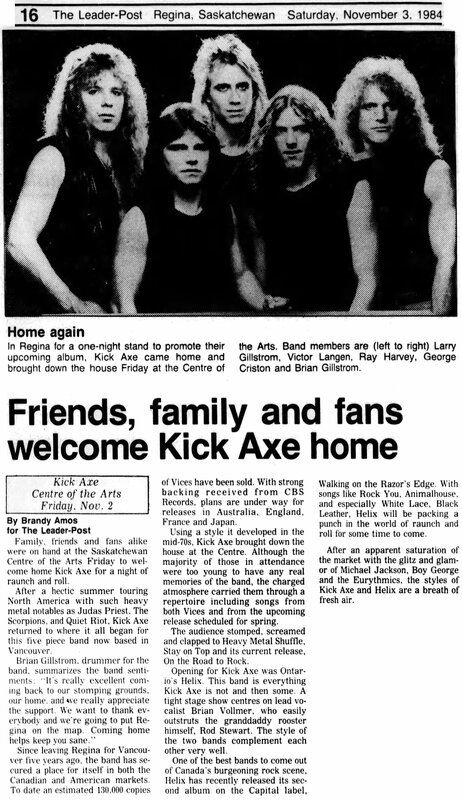 Using a style it developed in the mid-70s, Kick Axe brought down the house at the Centre. Although the majority of those in attendance were too young to have any real memories of the band, the charged atmosphere carried them through a repertoire including songs from both Vices and from the upcoming release scheduled for spring. The audience stomped, screamed and clapped to Heavy Metal Shuffle, Stay on Top and its current release, On the Road to Rock. Opening for Kick Axe was Ontario's Helix. This band is everything Kick Axe is not and then some. A tight stage show centres on lead vocalist Brian Vollmer, who easily outstruts the granddaddy rooster himself, Rod Stewart. The style of the two bands complement each other very well. One of the best bands to come out of Canada's burgeoning rock scene, Helix has recently released its second album on the Capitol label, Walking on the Razor's Edge. With songs like Rock You, Animalhouse, and especially White Lace, Black Leather, Helix will be packing a punch in the world of raunch and roll for some time to come. After an apparent saturation of the market with the glitz and glamor of Michael Jackson, Boy George and the Eurythmics, the styles of Kick Axe and Helix are a breath of fresh air.